Find out what's taking you from PR to PR, is it an increase in muscle size or activation on how important is how strong you already are? The British scientists got to the bottom of your gains by assessing the individual and combined contribution of the adaptations in neural (agonist quadriceps EMG, antagonist hamstring EMG) and morphological (quadriceps muscle volume and θp, the fascicle pennation angle) variables. "After a brief warm-up of submaximum contractions of both legs, participants completed four sets of ten unilat eral isometric knee extensor contractions of each leg; with sets alternating between dominant and non-dominant legs. Each set took 60 s with 2 min between successive sets on the same leg" (Balshaw 2017). the explosive contraction group completed short, explosive contractions with participants instructed to perform each contraction “as fast and hard as possible” up to ≥80% MVT for ~1 s, and then relax for 5 s between repetitions. the sustained contraction group completed prolonged contractions at 75% MVT, with 2-s rest between contractions. For both groups, the scientists provided a computer monitor that displayed the rate of torque development (10-ms time epoch) and a target torque trace 2 s before every contraction, in the explosive and sustained contraction group, respectively. 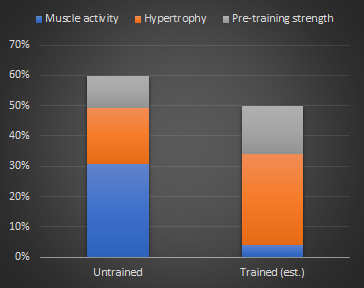 Without a follow-up study in trained individuals, we have to speculate to which extent increases in muscle activity, hypertrophy, and the pre-training strength explain the variability of strength gains in trained individuals. The above is my estimate - just an educated guess. What does the study tell us about better-trained individuals? If we compare the results of the study at hand to related study, it may be possible to make predictions about the driving forces of muscle growth in better-trained individuals, eventually, though, the study would have to be repeated with a different subject group to tell for sure. As Balshaw et al. point out, their results are in line with other EMG studies assessing the effect of training on the lower extremities. What is interesting, however, is that they conflict with a study by Erskine et al. (2014) who found only a marginal correlation between improved activity patterns and strength gains for the biceps a muscle with an already high level of activation even in untrained individuals. This result is important for our prediction because it suggests that a higher baseline activation level will reduce the contribution of improvements in agonist neural drive to the strength gains. This, in turn, obviously suggests that, in trained individuals who have already undergone significant improvements in neural drive, muscle activity will contribute significantly less to the strength gains than it does in untrained individuals. An equivalent to Figure 3 for well-trained athletes may thus look as I have sketched it in the figure on the left-hand side: Hypertrophy could make the largest, while improved muscle activation, only a marginal contribution to strength gains - but keep in mind: that's just an educated guess that is based on the assumption that the relative contribution of hypertrophy will increase as the relative contribution of improvements in muscle activation patterns will decrease over time (Note: Whether the three variables will then still explain 60% of the variation appears questionable, though; thus the 10% reduction in total predictive power in the figure above). Each subject performed the above isometric knee extensor RT thrice a week (3/week). Before and after isometric maximum voluntary torque (MVT) as well as the neural drive to the agonist (QEMGMVT) and antagonist (HEMGANTAG) were assessed simultaneously. In addition, QUADSVOL was determined with MRI and QUADSθp with B-mode ultrasound. So, there's clear evidence that size gains (hypertrophy), muscular activation (EMG) and, of course, the baseline strength determine the strength gains in resistance training rookies. 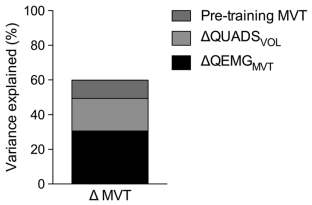 Figure 2: The relationships between the percentage change (∆) in knee extension maximum voluntary torque (MVT) and: (A) ∆ quadriceps EMG at knee extension MVT (QEMGMVT; r = 0.576, P = 0.001); (B) ∆ antagonist hamstrings EMG during knee extension MVT (HEMGANTAG; r = 0.298, P = 0.123) and (C) pre-training knee extension MVT (r = −0.429, P = 0.023), after 12 weeks of resistance training (Balshaw 2017). The pennation angle, and antagonist activity (here the hamstring) on the other hand appear to contribute only marginally to the increase in strength gains the previously untrained subjects saw over the course of the 12-week study. Figure 3: The scientists' multiple regression analysis reveals the strength of the contribution of each variable the scientists assessed in their study (Balshaw 2017). So, what's the most important contributor? That's difficult to tell. With the individual correlations being relatively weak, one cannot rely on the previously calculated slopes. Those give you an idea of what the real-world contribution would be if there was a perfect correlation between the individual variables. To answer the above question, we will thus have to turn to the subsequent multiple regression analysis of which the scientists highlight that it "found for the first time that these three variables simultaneously contributed to the total explained variance in strength" (Balshaw 2017). Even if you take the size gains (hypertrophy), muscular activation (EMG) and, of course, the baseline strength them into account, these variables explain only 60% of the total variance in strength gains - with the individual contributions (see Figure 3) being agonist neural drive, aka the muscle activation (EMG) explaining 30.6%, the size gains 18.7% and the pre-training strength 10.6% of the strength gains the rookies made over the course of the 12-week study... which leads me to an inevitable question: What about experienced strength trainees? I knew you'd be asking that and have addressed this question in the red box above Figure 1, so read it before you ask about the implications for trained individuals on Facebook! Balshaw, Thomas G., et al. 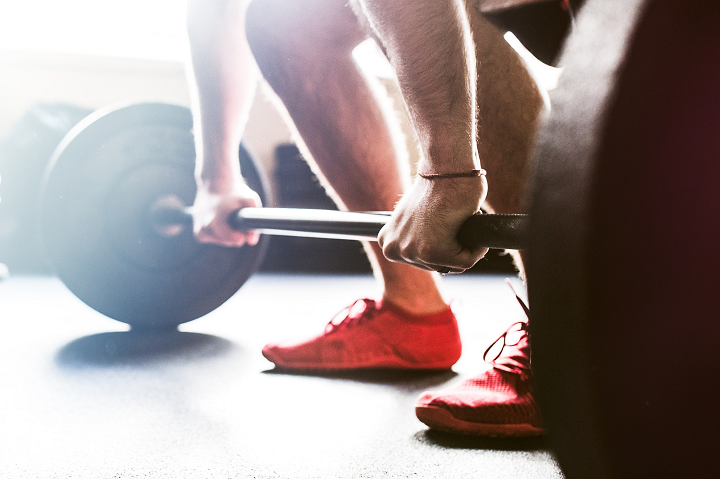 "Changes in agonist neural drive, hypertrophy and pre-training strength all contribute to the individual strength gains after resistance training." European Journal of Applied Physiology (2017): 1-10. Erskine, Robert M., Gareth Fletcher, and Jonathan P. Folland. "The contribution of muscle hypertrophy to strength changes following resistance training." 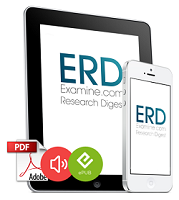 European journal of applied physiology 114.6 (2014): 1239-1249.